Bluestone Mountain, in central Summers County, rises to 2,487 feet above the northwest flank of the lower Bluestone River in the territory of the Bluestone National Scenic River. Parts of mountain near its feet are located within Bluestone State Park. 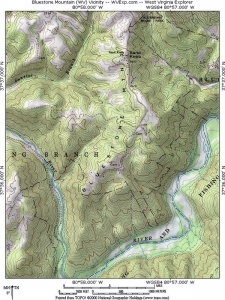 The Giles, Fayette and Kanawha Turnpike crossed Bluestone Mountain between the mouth of the Bluestone River and Jumping Branch, a tributary of the Little Bluestone River.